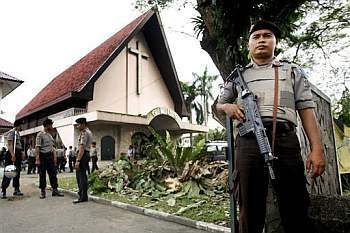 JAKARTA, Jan 4 — Religious intolerance appears to be on the decline despite reports of sporadic attacks on churches and prayer houses of minority sects, according to an Indonesian think-tank. One key factor was last year’s legislative and presidential elections that sapped the energy of the people, said The Wahid Institute in a report last week. “The legislative elections and the presidential contest could have diverted people’s attention away from religious conflict and tension,” it said. In its report on religious freedom and religious life in Indonesia last year, it recorded 93 incidents of religious intolerance last year, compared to 232 cases the previous year. The think-tank was founded in 2004 by the late President Abdurrahman Wahid, also known as Gus Dur, to promote moderate Islam. The report added that strict police action against the perpetrators of religious intolerance also contributed to the decline in the number of violations. But the institute’s director Yenny Wahid, who is Gus Dur’s daughter, warned that religious intolerance still remained a problem in Indonesia. “The situation in Indonesia is still drawing concern. Unfortunately, the government appears reluctant to admit that there is a problem in religious freedom in this country,” she said last week. Most cases of religious intolerance were recorded in West Java province while the rest took place in the special province of Jakarta, East Java and Central Java. “In West Java, the issue that haunted religious life was the spread of religious hatred against Jews, Christians, and groups or individuals deemed to be deviant,” said the report coordinator, Rumadi. The perpetrators of religious intolerance have also attacked houses and prayer places, issued religious rulings against deviant groups and called for a ban on the Ahmadiyah sect, which believes in a prophet after Prophet Muhammad. The Indonesian Ulama Council (MUI), the hardline Islamic Defenders Front and Muslim forum were cited as organisations responsible for intolerance last year, said the report. Cleric Abu Bakar Baashir, the former spiritual leader of Jemaah Islamiah terror network, and Kiai Ma’aruf Amin, head of MUI’s fatwa committee, were mentioned as perpetrators of religious intolerance. The MUI was blamed for issuing religious edicts against deviant groups.